A unique anti-aging serum that contains nanoized platinum combined with special ingredients that promote beautiful and healthy skin. Platinum has an amazing ability to resist coalescing substances and can break down the body's negative elements. These advantages allow platinum to balance and replenish the skin and deliver other beneficial ingredients that include Vitamin C, Aloe Vera, Retinol, Allantoin and Argireline. Regular use brightens the skin eliminating age spots and hyperpigmentation, improves texture and tone, and balances the complexion. The overall effect is radiant, healthy skin. This is step 3 in the Cosme Proud skin care routine. 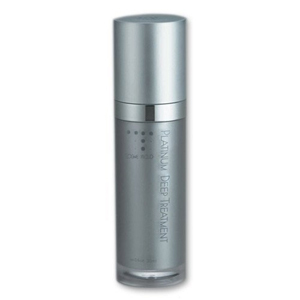 Apply Platinum Deep Treatment to trouble areas or use as a preventative anti-aging serum. For all skin types.